Welcome to hiking heaven! Old logging roads and hiking trails criss-cross Vancouver Island in British Columbia, providing easy access to alpine areas and inspiring mountain scenery. 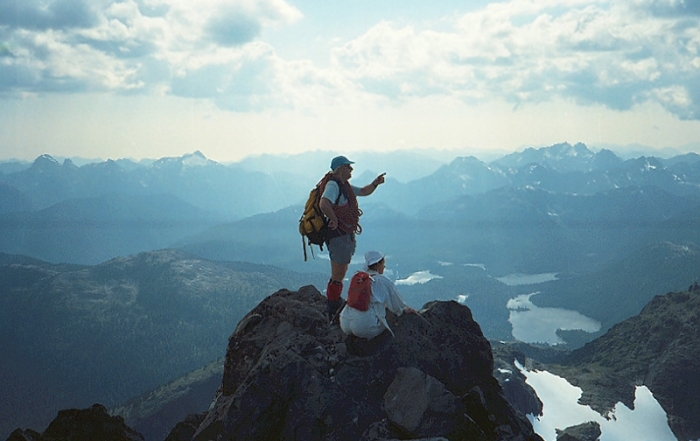 Less challenging than backpacking, day hikes provide lifetime memories of peaceful walks, bird watching and wildlife viewing. 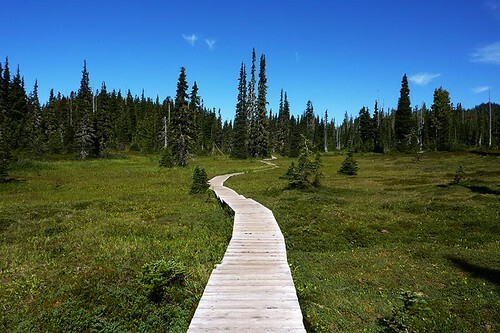 Along the many paths in our protected forests and BC provincial parks you’ll find the freedom to discover nature for yourself; an abundance of waterfalls, meadows, lakes and beaches – all reachable without guides, ropes or heavy packs. Just as Victorians can be proud of their lengthy Galloping Goose Trail, so too can they brag about the beauty of the Coast Trail. 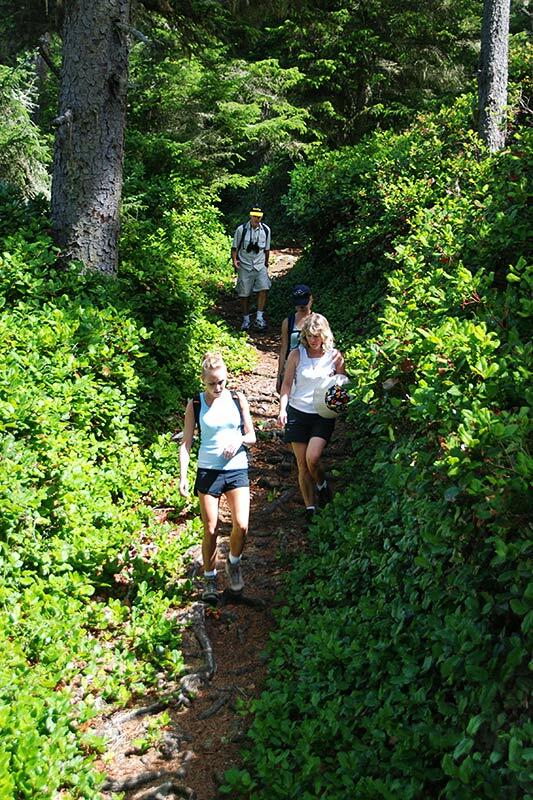 The 6-mile (10-km) trail, which runs beside the Strait of Juan de Fuca in East Sooke Regional Park near Victoria, is the ideal testing ground for a longer journey such as the West Coast Trail. It takes about seven hours to cover the Coast Trail round trip, which runs through the thickly forested rolling hills that rise above the strait between Becher and Iron Mine Bays. The shoreline, as rugged here as anywhere farther up the coast, forced the trail builders to deal with everything from windswept bluffs to rain-forest ravines. 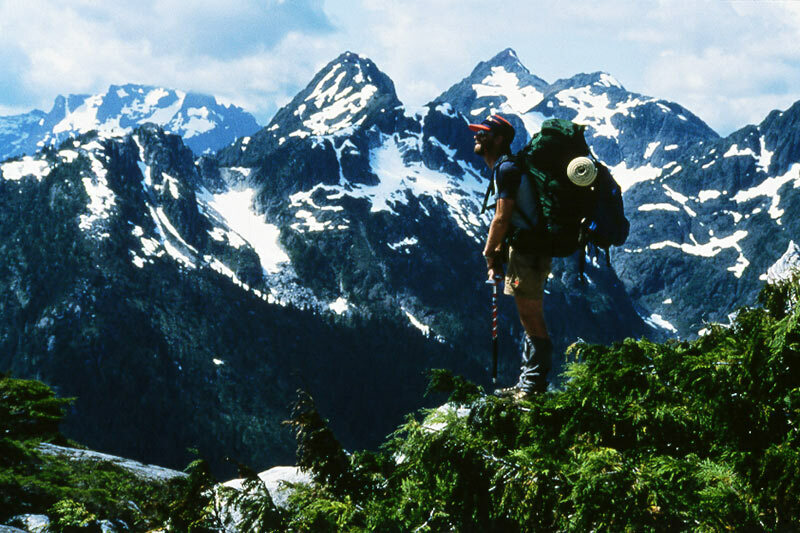 Occasionally the trail descends to sea level, allowing a hiker’s eyes the chance to range across the strait to the peaks of Washington State’s Olympic Mountains that dominate the southern horizon. 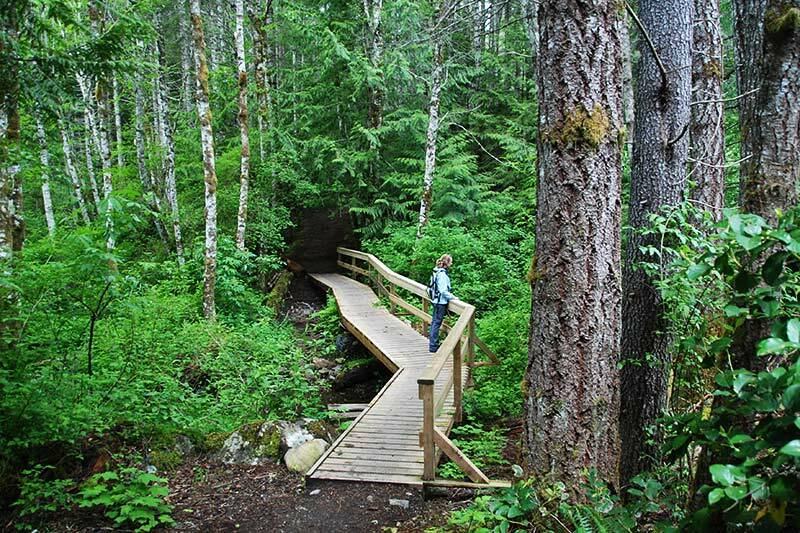 You don’t have to traverse the entire length of the Coast Trail in order to enjoy a visit to this large 3,500-acre (1420-ha) park. Watch for one of the trail’s most exotic features, a large petroglyph that is carved into the rock face at Aldridge Point, a 1.2-mile (2-km) ramble from the east entrance to East Sooke Park at Becher Bay. Once you reach Aldridge Point, the large sea-lion petroglyph is easy to locate. An interpretive marker is fixed on the hillside directly above the rock face on which it is inscribed. According to a Native legend, the petroglyph represents a supernatural animal like a sea lion that was responsible for the deaths of many of the Becher Bay Indians when they ventured out in their canoes. The tribe became nearly extinct; the remaining members were afraid to go out on the water, until one day a mythical man caught the sea lion and turned him into the stone representation seen on Aldridge Point. Although it’s helpful to have an incentive such as an ancient rock carving to draw you out along the trail, the natural beauty of the environment is enticement enough. Wild rose blossoms perfume the breezes that blow among the gnarled, smooth-skinned limbs of arbutus trees. Some of the park’s best beaches are located in several small coves around the bay at Creyke Point, about 0.6 mile (1 km) east of Aldridge Point. Follow the well-marked Coast Trail about a mile west of Aldridge Point to Beechy Point, where the ocean swells beat against the craggy shoreline. The old-growth forest is marvelously shaped by years of spindrift driven on the wind by winter storms. Far off in the west you can just make out where the trail ends at Iron Mine Bay. Shoulder your pack and head that way if you wish, or simply retrace your steps to Becher Bay and drive about 7 miles (12 km) along East Sooke Road to reach it. In fact, if you are intent on exploring the entire length of the Coast Trail, it would be helpful to go in two parties and leave a vehicle at each end, trading keys when you meet up in the middle. 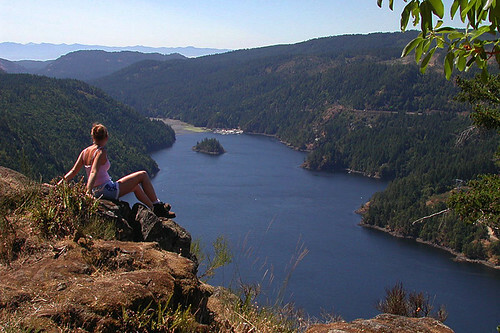 East Sooke Regional Park is located off East Sooke Road, just a 30-minute drive from Victoria. 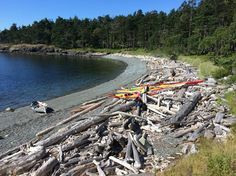 Within its 1422 hectares, East Sooke Park hosts a variety of environments, from windswept coast and rocky hilltops to open grasslands, sandy beaches and secluded coves. Energetic hikers travel the complete 6 hour Coast Trail, considered to be one of the premier day hikes in Canada. 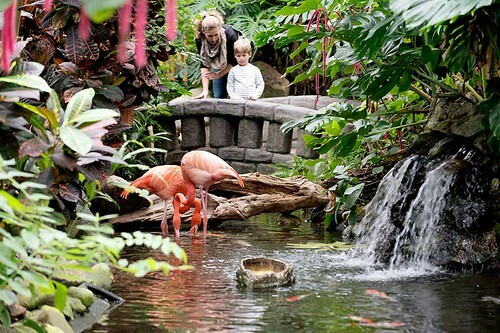 Besides hiking the 60 kilometres of trails through rain forest, there are many other outdoor activities to be enjoyed in the park. 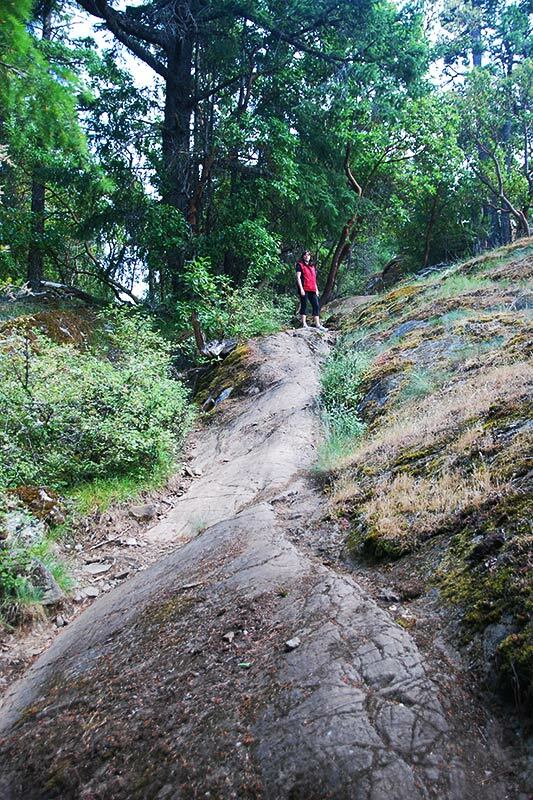 Seven main hiking trails run the length of Goldstream Provincial Park, including an ascent of Mount Finlayson. With the exception of the Prospectors Trail (moderate; 6 miles/10 km return) and the Mount Finlayson Trail (strenuous; 1,375 feet/413 m; 3 miles/5 km return), all of the trails run along the upland region of the park to the west of Hwy 1. 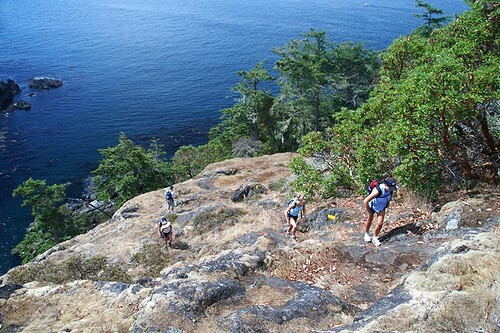 Other trails include the Arbutus Ridge Trail (moderate; 6 miles/10 km return), which begins from campsite #40 and climbs uphill through the drier upland regions of the park, where a profusion of wildflowers accompanies hikers from April to June, the finest season to enjoy this hike. The Upper Goldstream Trail (easy; 2.5 miles/4 km return) passes through some the largest groves of trees in the park as it heads to Goldstream Falls. The trailhead is beside the campground gatehouse, where trail maps are also located. You can reduce your hiking time in the park by beginning from the hiker’s parking lot located on the west side of Hwy 1, halfway between the campground and the day-use areas. Arbutus Ridge lies south of the parking lot, while the Gold Mine Trail (easy; 4 miles/6 km return) leads north to Niagara Creek. Highlights include evidence of old-time resource extraction, a tall falls that depending on the season may or may not have any water in it, and a short side trip to view an impressive wooden railway trestle still in use by the Esquimalt & Nanaimo Railway. The day liner passes over the trestle twice daily, Monday to Saturday, so if you’re here by 8:30am or 5:15pm you stand a good chance of seeing it whisk by. One of the most spectacular hikes on Vancouver Island is the trail over the Kinsol Trestle in the Cowichan Valley Regional District. The once-abandoned railway line is believed to be the biggest wooden trestle left in the Commonwealth. At 187.6 metres long and more than 38 metres above the Koksilah River, it is truly an amazing structure. A complete restoration of the Kinsol Trestle was completed in 2011, retaining 60% of the historic timber. The bridge now allows hikers and bikers to see more of The Cowichan Valley Trail and Trans Canada Trail. To access Kinsol Trestle, turn north at the 4-way stop in Shawnigan Lake Village and continue passed Mason’s Store on what becomes Old Port Renfrew Road for about 10km, then follow the signs. If you’re interested in a long hike to the trestle, with the occasional vista across Shawnigan Lake, drive up the Malahat and take the South Shawnigan Lake turnoff to Sooke Lake Road. Travel south-west on the gravel road until you reach the old CN right-of-way. It’s not well signed, but there’s a little parking lot. From there, it’s about a 13-kilometre hike to the trestle. The hiking trail (easy; 2 mile/3 km return) in Horth Hill Regional Park in North Saanich leads to one of the highest viewpoints at the top of the Saanich Peninsula. It climbs gradually through a semi-arid forest to the summit of North Hill. 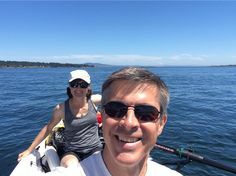 From here you have splendid views of the Gulf and San Juan Islands, Mount Baker’s volcanic cone, Hurricane Ridge’s scissor-cut profile, and all of the Saanich Peninsula and Inlet laid out before you in stark relief. 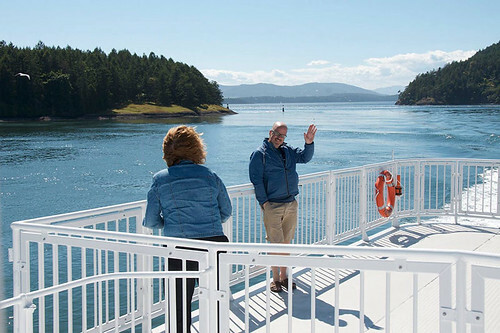 This is a good hike to do as soon as you arrive at BC Ferries’ Swartz Bay terminal. You can stretch your legs, taste the island air, and orient yourself for further exploring. To find the park, head west on Wain Road from Hwy 17, just south of Swartz Bay. Follow signs pointing north on Tatlow Road to the parking lot and trailhead. You’ll often have this trail to yourself. When you hike the trails in John Dean Provincial Park in North Saanich, you are following some of oldest in the provincial park system. 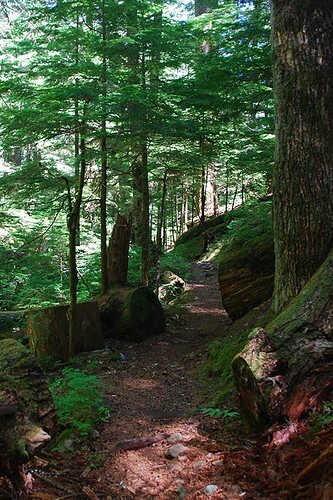 You are also following in the footsteps of the local First Nations people who, legend has it, rode out the great flood atop Mount Newton (1,007 feet/302 m), or Lau Welnew, “the back of a whale.” There is great hiking here for those who admire old-growth forests. At heart of this park are some the largest Douglas fir that remain on the south coast of Vancouver Island, as well as a mix of grand fir, western red cedar, Garry oak, and arbutus. Five hiking trails of varying degrees of difficulty and length cross the south and east face of Mount Newton. Explore here in spring to see a vivid display of wildflowers native to British Columbia, including drifts of blue camas lilies, which carpet the understorey, as well as red Indian paintbrush and white erythroniums. Wildlife flock to the food-rich forest, and from the top of Mount Newton, you can watch as ravens, red-tailed hawks, bald eagles, and turkey vultures put on a colourful display of soaring techniques. The summit of Mount Newton is renowned as the place to watch some of the best sunsets in British Columbia. To find the park, head west from Hwy 17 on McTavish Road to East Saanich Road, then south on East Saanich to Dean Park Road and follow this road to its western terminus, where trails begin from the parking area. Gowlland Tod Provincial Park in Saanich offers over 25 miles (40 km) of trails. In the afterglow of goodwill that followed Victoria’s hosting of the 1994 Commonwealth Games, local and provincial governments, as well as interested private companies, joined together to create the Commonwealth Nature Legacy. 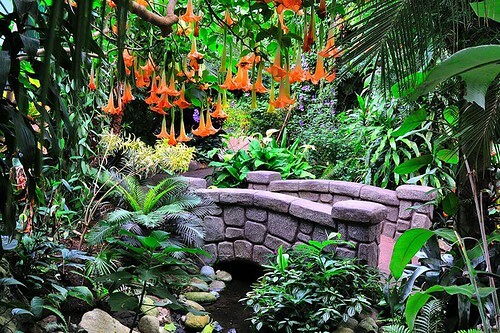 The grand purpose of the project is to further protect the remaining natural spaces that surround the ever-expanding city. Gowlland Tod Provincial Park protects a significant part of the Gowlland Range, one of the last remaining natural areas in Greater Victoria, and a portion of the natural shoreline and uplands in Tod Inlet, which adjoins the Saanich Inlet south of Brentwood Bay near Butchart Gardens. Included in this park are representative examples of the rare, dry coastal Douglas fir habitat that features old-growth forest, wildflowers, and stands of arbutus and manzanita. Old mining and logging roads in the park now serve as hiking trails. There are three access points to the park, which shares a common boundary with Mount Work Regional Park. For those hikers who enjoy easygoing trails coupled with access to Tod Inlet’s shoreline, take Wallace Dr from either of its two intersections with Hwy 17A. The trailhead at the north end of the park is located on the west side of Wallis Road opposite Quarry Lake. A second trailhead is located on Willis Point Road west of Wallace Dr and is shared with Mount Work Regional Park. 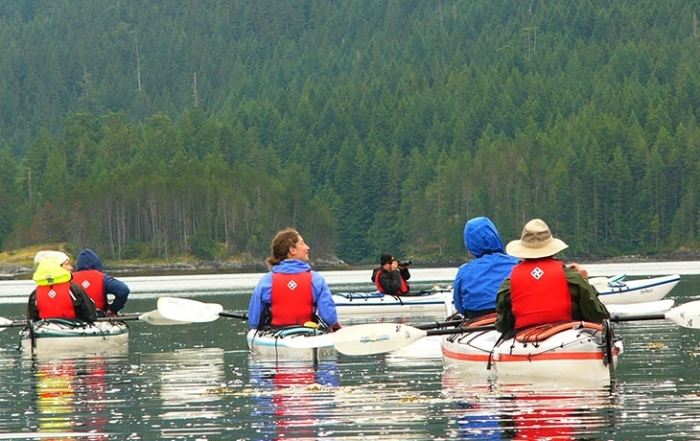 Trails provide seaside access to McKenzie Bight and climb to spectacular viewpoints and rocky outcroppings on Partridge Hills and Jocelyn Hill. The southern entrance to the park is reached by following Millstream Road north from Hwy 1 to Caleb Pike Road, then a short distance west to the trailhead. From here trails lead to Holmes Peak, Mount Finlayson, and Jocelyn Hill. Bear Hill Regional Park is paired with Elk / Beaver Lake Regional Park. Over 11 miles (19 km) of easygoing hiking trails link Eagle Beach with popular North Beach on Beaver Lake. For a more vigorous workout, head for Bear Hill Regional Park. The trailhead is located on Bear Hill Road east of Oldfield Road north of Elk Lake. The extensive park features more than 1,000 acres (400 ha) of lush wetland, tranquil forest, and panoramic hilltop vistas of the Saanich Peninsula. 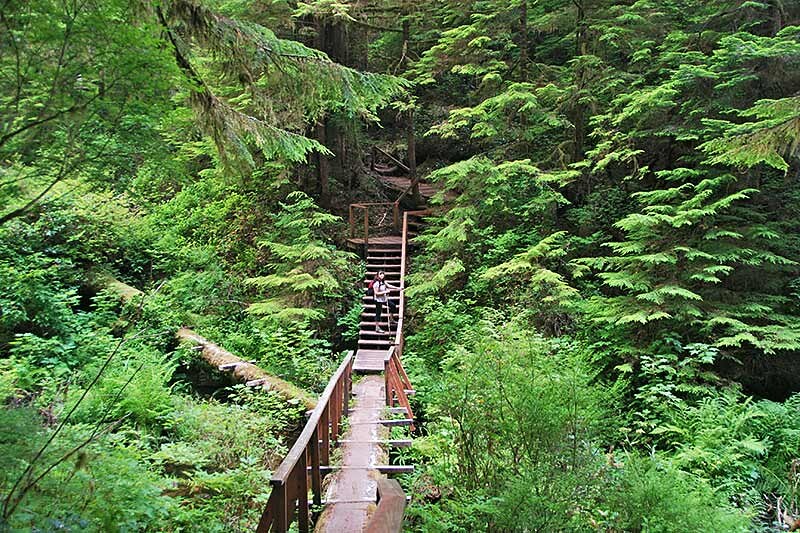 Juan de Fuca Marine Trail is a 47-km hiking trail that stretches along the western shoreline of southern Vancouver Island, from China Beach to Botanical Beach. 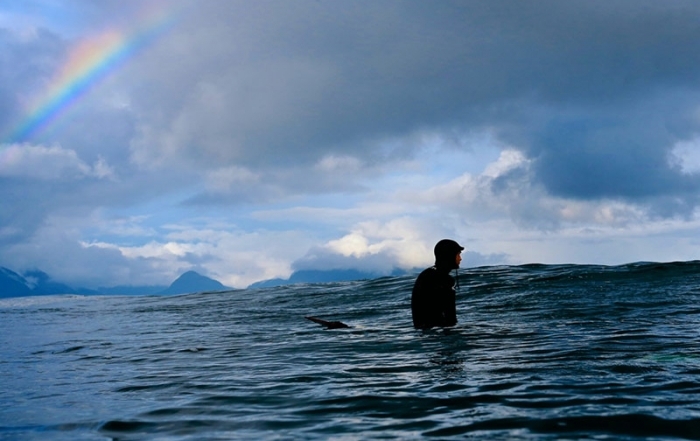 The trail offers rugged beauty, wildlife viewing and roaring surf in its course along the Strait of Juan de Fuca. 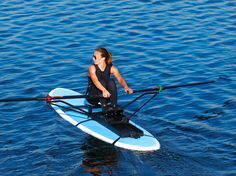 It has been designed to meet the needs of both day-trippers and the more experienced hiker. Cowichan River Footpath in Cowichan River Provincial Park winds along the scenic Cowichan River from Glenora to Skutz Falls, crossing the river there and follows the north bank almost to Lake Cowichan. The footpath takes hikers along some of the most scenic river stretches on Vancouver Island. Great fishing in the Cowichan River too! Both Englishman River Falls Provincial Park and Little Qualicum Falls Provincial Park have rambling trails that lead beside the clear waters of these pristine rivers. A walk to the falls is a big part of a visit to either park. Carmanah Walbran Provincial Park is located adjacent to the West Coast Trail unit of Pacific Rim National Park, on the West Coast of Vancouver Island. Road access to the Carmanah trailhead is via Highway 18 from Duncan to Lake Cowichan, and a further 70km on gravel logging roads. The Nootka Island Trail (also called the Friendly Cove/Yuquot Trail) rambles between Louie Bay on the north side of Nootka Island and Yuquot (Friendly Cove) on the south. 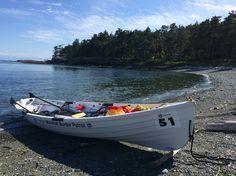 Along the way, the trail crosses exquisite beaches and tidal shelves, as well as leading inland to bypass rocky headlands and deep river mouths. 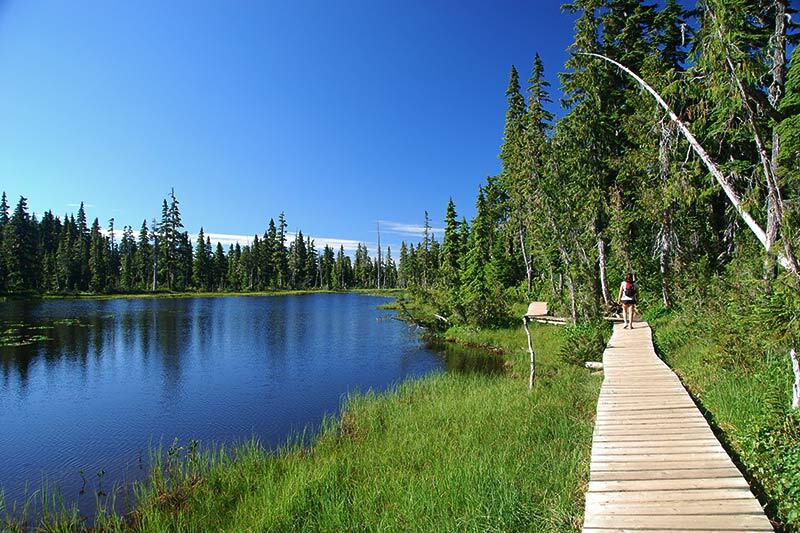 This 22-mile (35-km) trail is gradually becoming a choice hiking destination, and is a complement to the West Coast Trail. 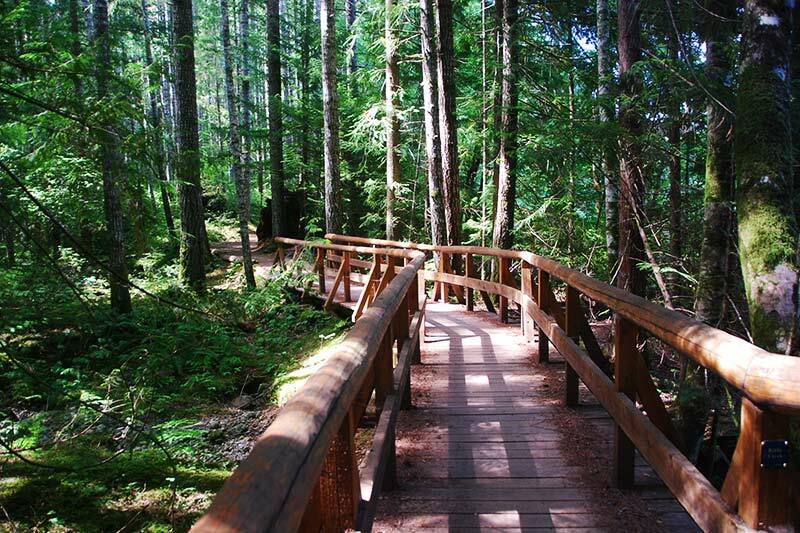 By comparison with the West Coast Trail, the Nootka Island Trail is poorly marked and infrequently maintained. Be prepared to bushwhack around fallen trees brought down by the frequent, savage winter storms that pound this section of coast. In order to avoid an exhausting amount of bushwhacking, consult tide charts for the most opportune times to cross beaches. Allow seven days to complete the hike one way. 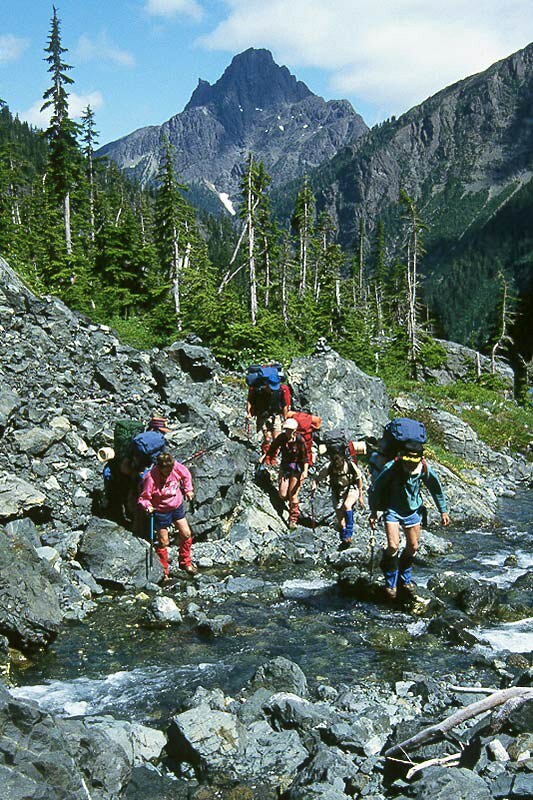 Hikers must be completely self-contained and are advised to carry a handheld marine radio, as the sole source of help is from the lighthouse staff at Yuquot. Note: There is a large population of bears on Nootka Island, and chances are good that hikers will encounter them along the beaches. At present, these bears do not associate hikers with food. Cache all supplies well out of reach of these animals. 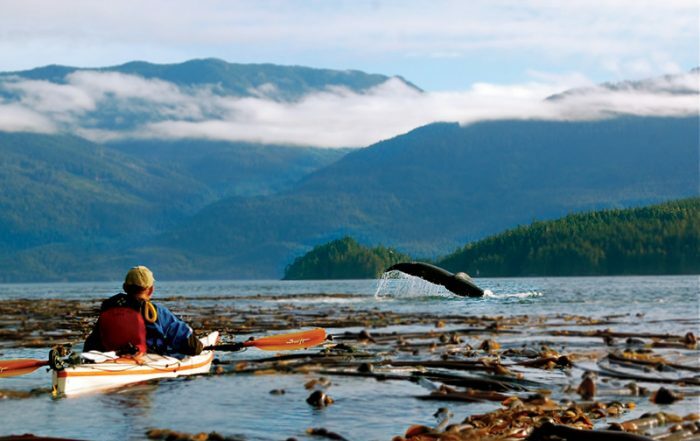 Access to Louie Bay is by floatplane from Gold River or Tofino; to Yuquot, by the MV Uchuck III. 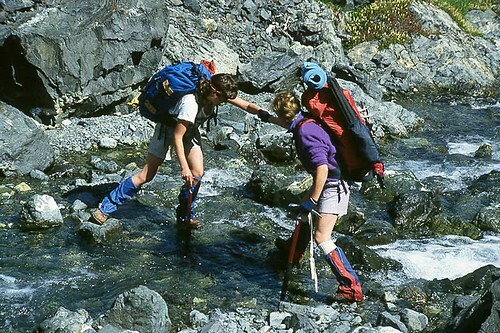 The trailhead for the Ripple Rock Trail (easy; 5 miles/8 km return) is located on the east side of Hwy 19 about 4 miles (6 km) north of the Ripple Rock Rest Area, which is just north of Campbell River. The roadside parking area is well marked. 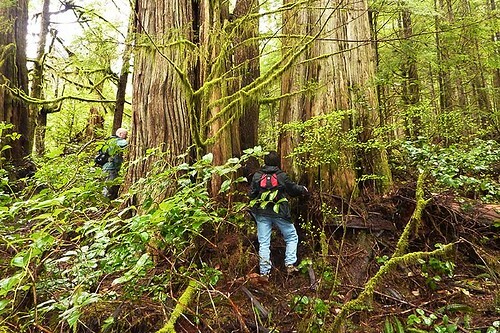 The trail leads hikers through abundant second-growth forest (with a few spectacular examples of old-growth Sitka spruce and Douglas fir on the east side of Menzies Creek) to a viewpoint of the treacherous waters in Seymour Narrows. Despite the blasting away in 1958 of the twin peaks of Ripple Rock, which lies underwater directly east of the viewpoint, large boats are still harassed by the rip tides, swirling currents, and whirlpools that constantly agitate the surface of the narrows. Other hiking trails of the same distance and difficulty that lead off from Hwy 19 include the McNair Lake Trail, 22 miles (35 km) north of Campbell River, and the Dalrymple Creek Trail, 35 miles (57 km) north of Campbell River. 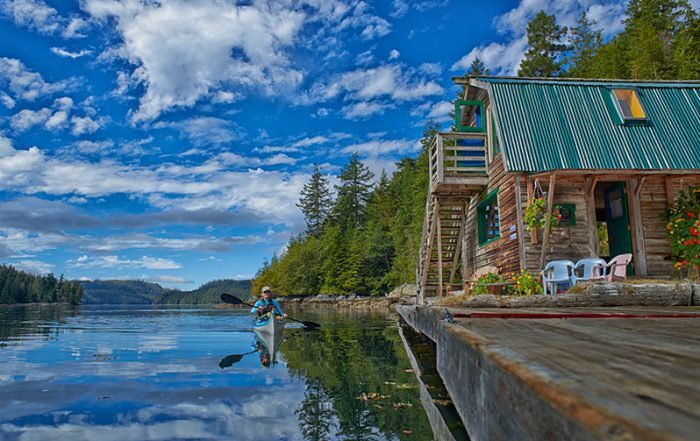 Because the Gulf Islands are so tightly configured, it’s often difficult to determine where one begins and another leaves off, especially as Vancouver Island provides such a big backdrop that it takes on the appearance of a mini-mainland. 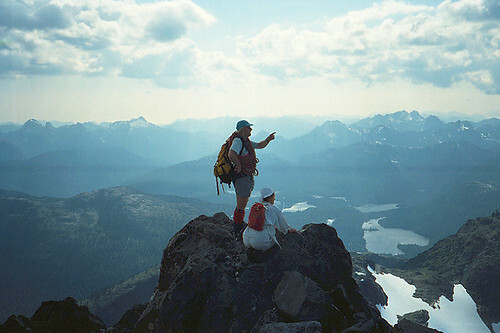 One of the best ways to sort things out is to take a hike to some of the higher viewpoints. There aren’t as many hiking trails found in the islands as on the mainland. 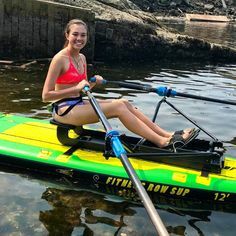 In part, this is a reflection of size, steepness, and also choice: most visitors come to the islands to indulge in activities centred around the water. 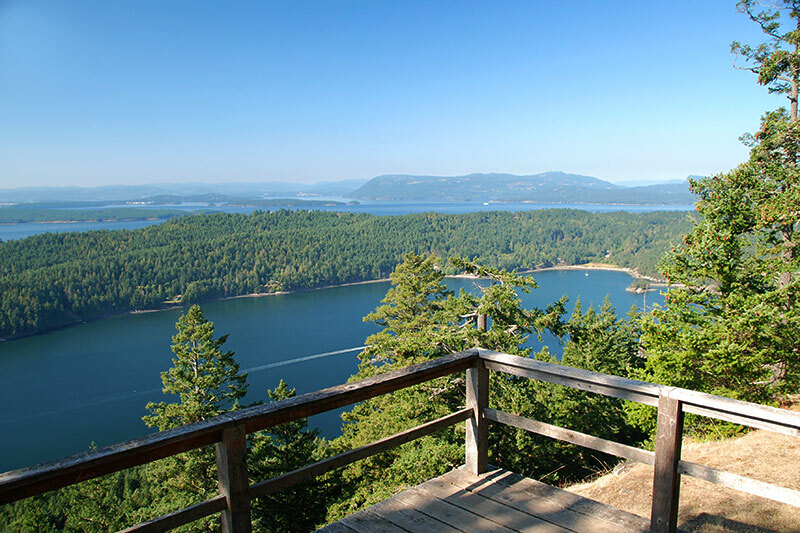 You will find good hiking and walking trails, however, on Galiano Island’s Bluffs Park and the Bodega Ridge Trail in the Bodega Ridge Nature Preserve. Another viewpoint worth seeking out is on South Pender Island. Mount Norman dominates the southern half of the twin islands, forcing traffic to divert around its north flank. Take Canal Road west where it divides and continue a short distance to the trailhead for Mount Norman Park (Beaumont/Mt. Norman (part of Gulf Islands National Park). From here it’s a steep 1-mile (1.6-km) walk uphill along an old logging road. The detritus left behind from recent logging is not a pretty sight, and it will be some time before reforestation masks the damage. Make the journey only on a day when you’re guaranteed a good view. Once on top you’ll find an observation platform with a wooden bench on which to rest while you get out your binoculars. The views from here are directly west over Bedwell harbour towards Salt Spring Island, Victoria, and southern Vancouver Island and south across Boundary Pass into Washington. Follow a rough trail from the viewpoint boardwalk through the salal to the east side of Mount Norman for a view of the sun-weathered flanks of Saturna Island, and beyond to Vancouver and the British Columbia-Washington mainland. Newcastle Island Marine Provincial Park is located adjacent to Nanaimo, with access by passenger-only ferry from Maffeo Sutton Park, behind the Civic Arena in Nanaimo. The 19 kilometres of day-hiking trails provide access to unique historical sites on the island while enjoying excellent views of the Strait of Georgia. Nearly half of the hiking trails are designed as multi-use, and allow bicycle access on signed trails. 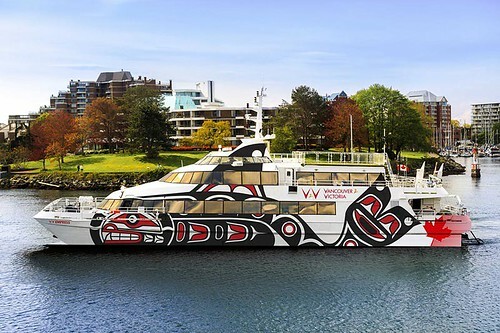 The foot passenger ferry will transport bicycles to and from Newcastle Island. 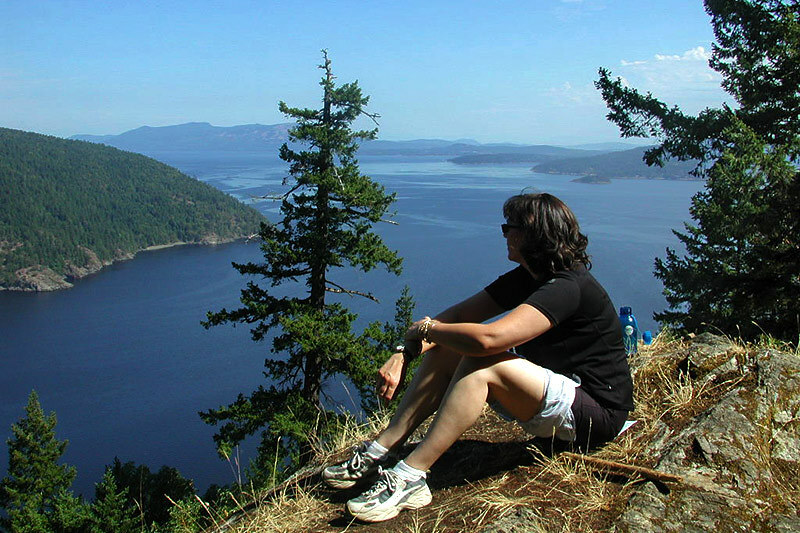 The most challenging hiking of all is found on Saltspring Island, where rough trails lead to the tops of both Bruce Peak (2,326 feet/709 m) and Mount Tuam (1,975 feet/602 m), the tallest points of land on the Gulf Islands. From Fulford Harbour at the south end of the island, take Musgrave Road west from Fulford Harbour to reach both trailheads, though eventually by different routes. One leads north off Musgrave to Bruce, while another leads south to Tuam. You’ll find great views from both down onto the Saanich Inlet and Peninsula, and across Satellite Channel to Cowichan Bay. If you make this hike in summer, take plenty of drinking water with you as these open slopes are baked by the sun. Good books to consult for information on these and additional trails include Hiking the Gulf Islands by Kahn and The Gulf Islands Explorer by Bruce Obee. 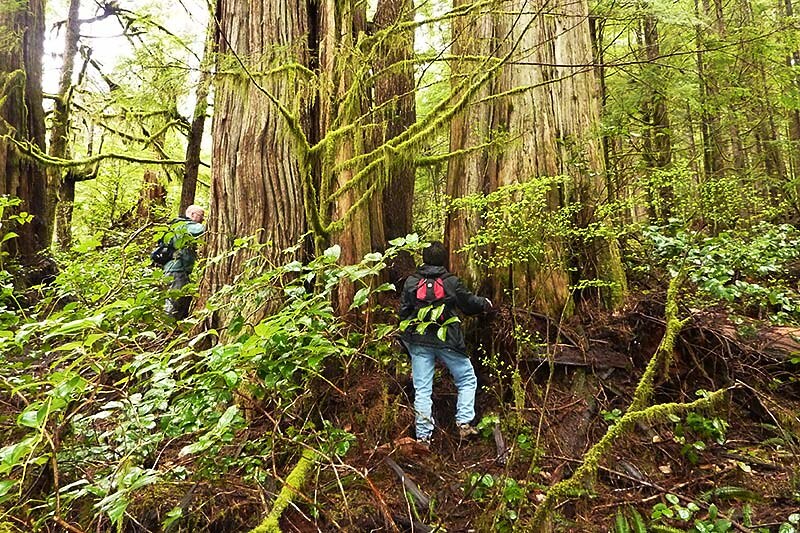 A nature walk along the forested shoreline of Shelter Point Regional Park on Texada Island takes visitors through a setting that could have been the inspiration for author J. R. R. Tolkien’s giant marching trees featured in his Lord of the Rings trilogy. Long branches from two groves of Douglas fir spread like muscled arms above each end of the trail. 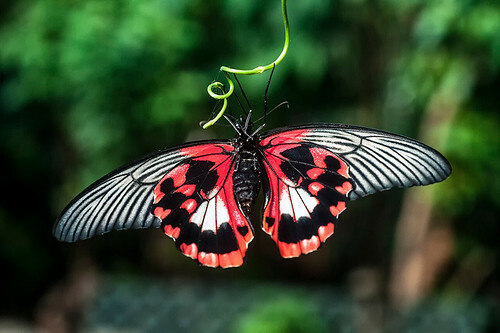 Although sturdy, most of their tops have been cropped by winter storms. Eagles and osprey rest in the tallest boughs when they aren’t out cruising the coastline for a meal. Others also have drawn sustenance from these waters for many generations. When the tide is out, look carefully from the promontory at the south end of the nature trail and you may be able to discern an ancient V-shaped rock fishing weir, fashioned by Indians of the Sliammon Nation. (Once frequent visitors to Texada, their traditional village was located where the Powell River pulp mill complex now stands.) 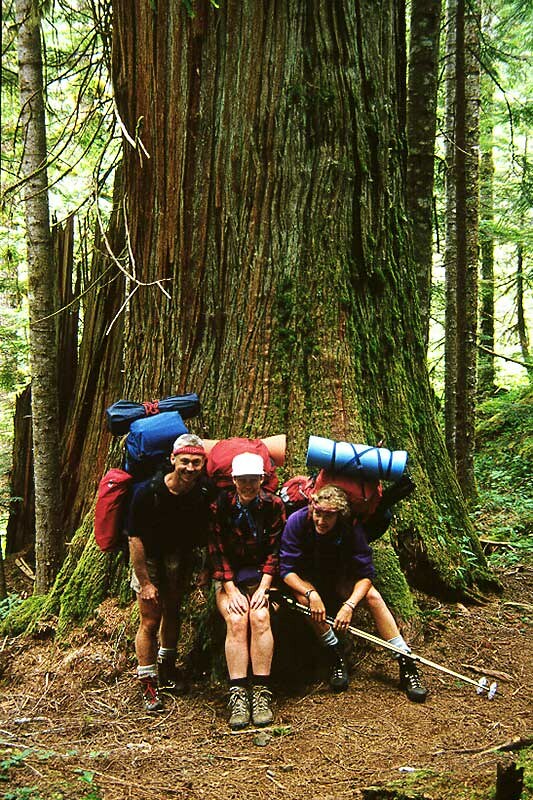 Near the south end of the trail stands the gnarliest Douglas fir of them all, a full 7 feet (2.1 m) in diameter. As you look west from here across the Strait of Georgia at the Comox Glacier’s broad white expanse, you get one of the best views of central Vancouver Island. Lasqueti Island lies off to the southwest. The trail loops back from its southern terminus at a gravel road through the forest to the giant fir. You can also choose to walk partway on a rough shoreline trail that branches away from the main trail and leads past arbutus and western red cedar. 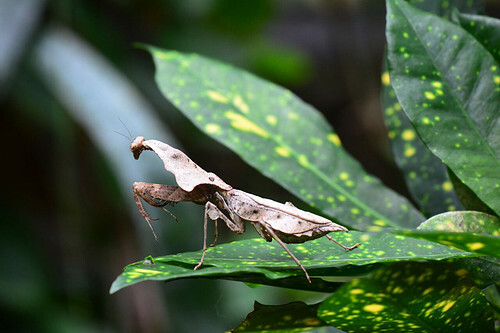 Also watch for the wild honeysuckle vines that entwine themselves around tree trunks in several places. The 2-mile (3-km) loop trail begins south of the entrance to the park’s newly expanded campsite area. Although not well marked, the trail is easy to locate. Owing to the low elevation of most Gulf and Discovery Islands, walking routes are neither lengthy nor challenging. Some of the best trails are on Hornby Island and lead around Helliwell Provincial Park. 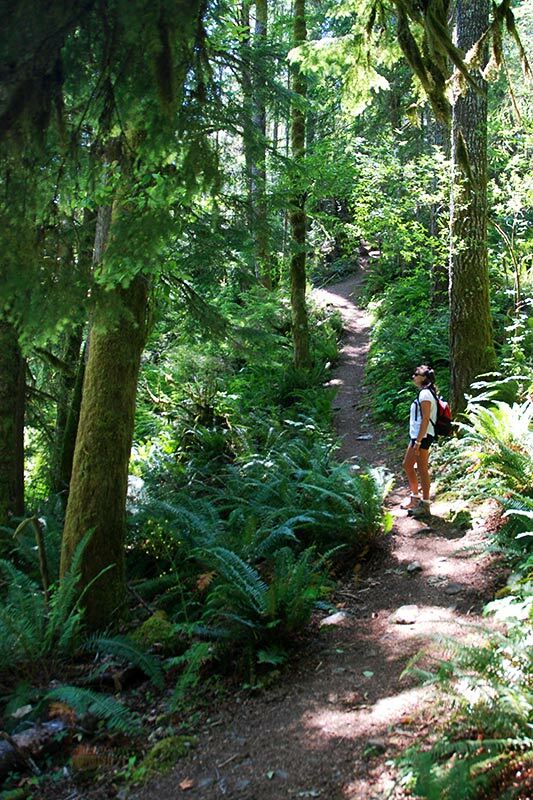 A 3-mile (5-km) loop trail follows the bluffs that rise above the beach and lead through open fields and stands of magnificent old-growth Douglas fir. One of the best times to be here is in late April and early May, when wildflowers carpet the hillside above the beach. Parks are selected and cherished for their natural beauty and diverse habitat, and in British Columbia, we are blessed with a staggering number of regional, provincial and national parks from which to choose. Trails on Vancouver Island accommodate hikers, bikers, horse riders and cross-country skiers. Backcountry trails are normally primitive, doing no more than necessary to get you to your destination. What all these trails have in common, is a need for their users to be able to look after themselves. Remember, away from the road it’s a wilderness…. and it sure is beautiful country! 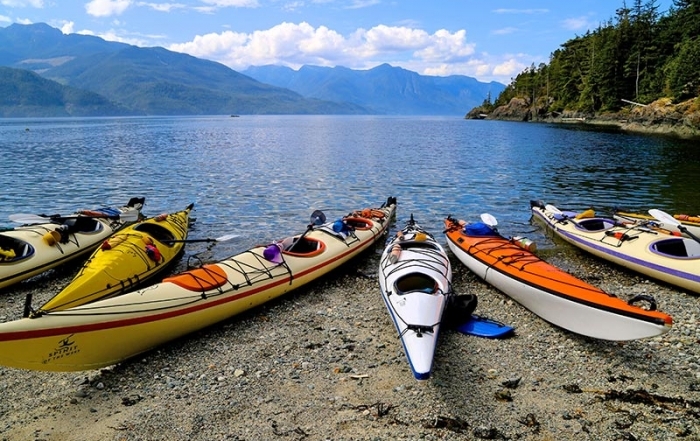 On Vancouver Island it is possible for the well-prepared backpacker to travel many days in rugged wilderness (home of cougar, wolf and bear), trek through coastal and old-growth rainforest, along deserted beaches and alpine meadows. And freedom in the wilderness is not the sole domain of seasoned hikers – guided adventures can be tailored to suit individual experience, limited only by your imagination and desire to conquer. 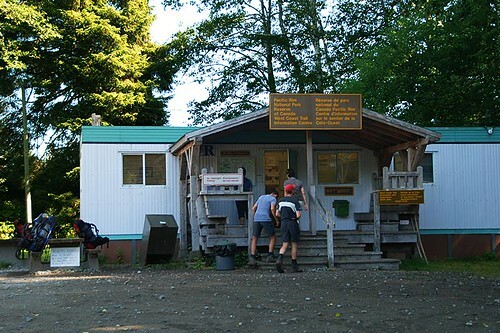 Cape Scott Provincial Park, located 450 km from Victoria, encompasses 21,850 hectares of rugged natural parkland, including over 60 km of hiking trails. Well-prepared hikers will slog through some of the muddiest and most tortuous terrain of any trail in British Columbia to reach Cape Scott, a distance of 27 km from the parking lot. 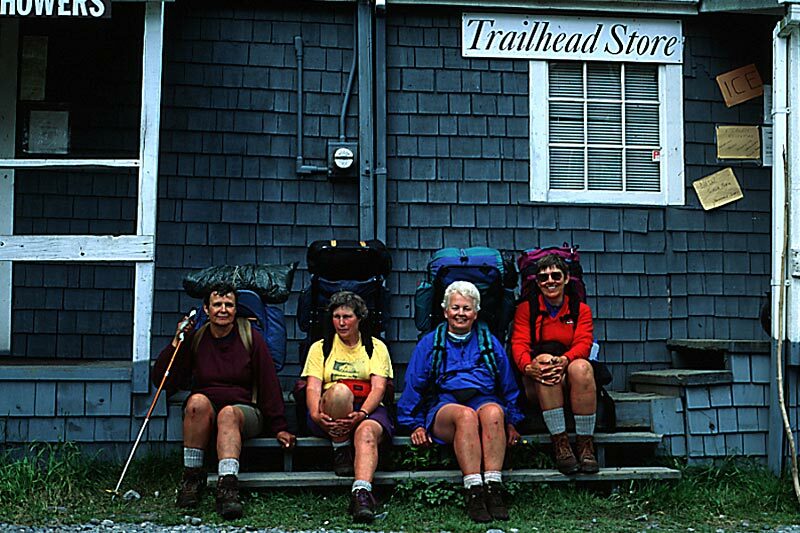 The longest of the Cape Scott Hiking Trails is the North Coast Trail. The nearest settlement to this remote wilderness area is Holberg. 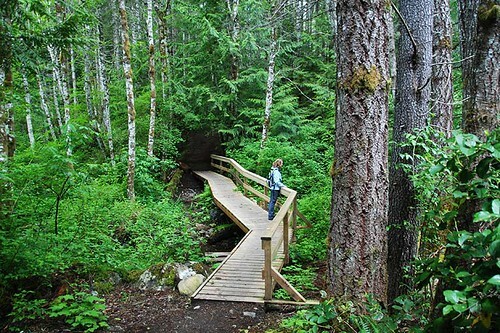 Hiking Trails in Cape Scott Provincial Park. The West Coast Trail is a strenuous 77-kilometre trail originally developed as a life saving trail for shipwrecked mariners. This magnificent and strenuous trail takes the hiker along the wild and remote West Coast of Vancouver Island. It can be travelled on foot from May to September, and demands all the strength and stamina of hikers travelling and camping along its rugged and often rain-soaked length. 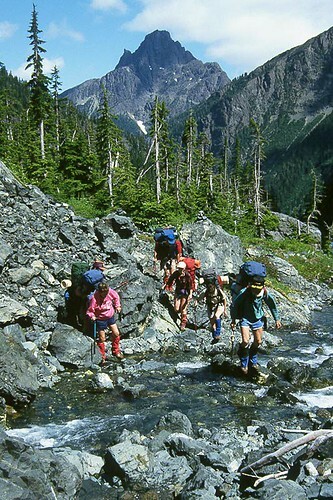 Only competent and well-conditioned backpackers should attempt the entire trail route, which normally takes six days to hike. If hiking in British Columbia sounds exciting to you, then Heli-Hiking on Vancouver Island will blow you away. Helicopters will provide you with unique views of valleys, glaciers and mountain peaks as you are whisked to an altitude of between 6,000 and 8,000ft. Your small, guided group selects a vigorous or relaxing hike prior to setting off to learn about nature as you stretch your legs and explore rocky mountain ridges and flowered meadows.